Chicken Sale & Lamb Ahead! We had our first (and possibly last for this year) chicken butcher day a few weeks ago and now have some lovely birds for your table! We used a new supplier for these guys and they were the healthiest batch we have ever seen – in fact, they grew to be enormous birds. They are the broad-breasted Cornish Cross that we have raised in the past, back by popular demand. We have whole birds only this time and they are currently on sale for $5.15/lb for any quantity. As I mentioned before, some of them grew to be the size of small turkeys (!) and weigh in between 7 and over 8lbs! I just cooked one of the huge ones up this afternoon and it was quite do-able in my normal brine pot and roasting pan. It is delicious! Anyway, we are offering a special price on these large birds of $4.85/lb. A great deal that we hope you will take advantage of. If you would like a smaller bird, please order early, we have limited supply of 6lb ‘smalls’ this round. As always the birds are fed only organic/gmo-free feed and are raised on pasture. We are happy to deliver to the Eugene area or you can come pick up here at the farm. We are also taking orders for lambs, we have whole animals available for $6.99/lb hanging weight and we are also selling 1lb packages of ground lamb for $10 each. We will likely butcher in about a month or so, but have ground lamb available now. Please let me know if you have any questions and thank you for supporting a small farm! Greetings, folks! It came to my attention recently that we had been neglecting this site. Having concentrated on email and Facebook for a while (and frankly not having a ton of desire to spend more hours than I do at my day job in front of a computer), I checked and saw that the last post was several years ago – oops. Things on the farm have been chugging along well in that time. We have shifted our focus to raising more sheep and less poultry, for one thing. This was a decision based on several factors, the main one being that sheep eat grass as their only food here, whereas even pastured poultry must eat grain as well. It feels better for us to focus on animals that are able to get all of their feed from our local acreage and to minimize the feed that we truck into the farm. That being said, we do still raise ducks, mainly for restaurants – please do check out Grit if you’re local and haven’t already! The food is amazing and it is a lovely space to spend time in. We have a wonderful relationship with the owner, Ashley, and her staff there. She is very supportive of local farms and we even graze our sheep on her acreage! 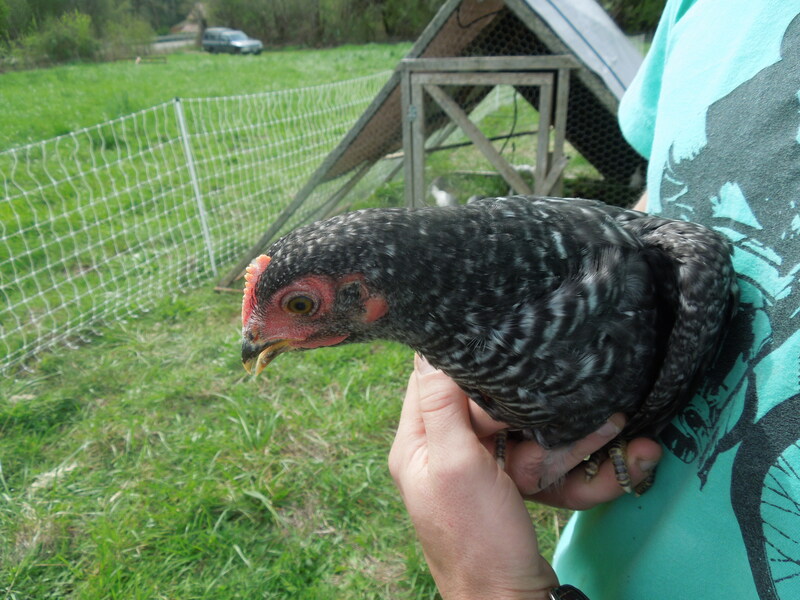 And of course, we still raise some tasty chickens, though we have transitioned to a new breed. Formerly, we raised Cornish Cross birds, which are the primary meat chicken raised in the U.S. They have broad breasts and grow quickly into plump birds. However, they are not your typical chicken- moving around energetically, scratching and pecking. They basically live to eat and we didn’t feel good raising them. So, after a trial last fall, we have transitioned to Red Rangers. These guys are great! They grow at a more measured pace and range around actively. They are a pleasure to raise. Their carcasses are a bit different, with narrower breasts, and we find the meat to have a richer flavor. We hope you’ll give them a try! We have our first batch of the year in the brooder now and will butcher in the late fall. Please email us to reserve your birds as this year quantities are limited. Finally, we have some changes in how we sell lamb this year. For the first time, we are offering individual cuts for sale to families! I will get the price list up on this site soon. Of course, we still have whole (and a few half) shares available. The next butcher date will be in October. Other than that, we are all doing well here. Mostly we are glad that the smoke has cleared up here for the time being. We are eyeing the plums on our trees (one more week!) and sending Tom off to kindergarten (!) next week. We’re scheming some family discount pricing for the fall and winter and will update you on that soon. As always, thanks for supporting small farms! The end of the season is in sight for us here at Loud Pond Farm! Our last batch of birds is on pasture and will be processed by the end of October. This includes duck! Please send us an email if you’d like to reserve one, as they are quite popular. We are also happy to announce that we are selling cuts of lamb – so if you’ve always wanted to try some but haven’t wanted to commit to a half or whole animal, pick up a leg or some chops to try! We will post our lamb cut price list here soon… till then, get in touch and we’ll send you the details. We have been enjoying the past week of sunny weather here on the farm with some stereotypically autumn activities: cutting, splitting, and stacking firewood and pressing cider (plus the not so glamorous cleaning gutters and clearing up of the lingering detritus from our recent move). We have exciting news to share with you from Loud Pond Farm! After a year of planning and a rigorous application process, we are participating in a program for young farmers that finances property purchase based on a solid business plan (as opposed to actual income). We closed on our farm at the end of June and just completed our move to Noti! This is a dream come true for us and so much hard work has gone into the process. The farm is very close to our leased property and the ability to work where we live will alleviate a huge amount of stress from our lives. Plus it is a beautiful place with room for our two families and land that both Phil and Able have worked on in the past. In honor of this occasion, we are having a sale! We’re offering buying club pricing on whole birds, at whatever quantity you would like to purchase – so that’s $4.15/lb, a savings of over 15%! Please order by Tuesday, August 6th for delivery on Thursday, August 8th to take advantage of the sale. Duck is going fast, so let us know ASAP if you would like to order. It will be available August 10th. We plan to raise additional ducks later in the season, so we will offer this again (plus duck and chicken eggs too!). Thanks for supporting our farm as we grow! What a spring it has been so far in Western Oregon! We have seen so many sunny days in the past month, we thought it was June. Now the much needed rains are back, but we are so grateful for the burst of energy that the sun provided us. 2013 is shaping up to be a great year for us here at the farm. We are expanding our poultry operation considerably – expect to see us at several farmer’s markets and more of your favorite Eugene restaurants (including Party Downtown, to open in May!) We will be offering whole chickens plus breasts, thighs/drums, wings, livers, and stock packages this year. Check out 2013 pricing here. Fresh birds will be available May 1st. Our sheep flock has expanded too! Currently we have mamas and lambs grazing gorgeous certified organic pasture that we lease in the Willamette Valley. We hope that you’ll choose Loud Pond Farm products this year, whether you’re a returning friend or a new one. Our families look forward to providing you with high quality pastured meats this year!